What do we spend the money on? What’s happening on the night? What’s THE TOMB OF DOOM? Air raid shelter goes spooky! Spaces limited / £1 per ticket / Year 6 priority / pre-booking required. Complete Tomb booking form on page 2 and give to your teacher / school office OR email fodjbrighton@gmail.com with the information on the form. All Downs Junior students – this year we’re having ONE amazing event, not two. On the door only. 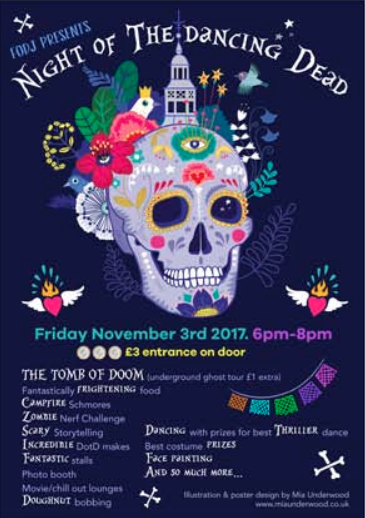 £3 entry / £1 extra for Tomb of Doom + lots of small change for those spooky activities. It’s all happening right now with SOS! Please join in these two actions to keep the schools funding crisis in the news and on the agenda. Together we can reverse the cuts! Save Our Schools is holding a national event next Wednesday. We will assemble at Downs Juniors, outside the Rugby Road school entrance, to hold hands with friends and family to show how much we love our school. Schoolchildren across our city, as well as West Sussex, Birmingham and Manchester will be joining in the action at the same time. Parents are invited to take pictures and post them on their own social media. We will be taking pictures to post on the SOS Facebook page, tweet and send to the media. Colour in the SOS flyer that came home in book bags, take a picture of yourself with it and email the photo to saveourschoolsbh@gmail.com AND saveourschoolsdjs@gmail.com. Put it up in your window. 15 photos will be selected w/c 9th October – if your picture is chosen you’ll be one of 15 children (and parents) having tea with your MP at Westminster. ALL TERMS & CONDITIONS ARE ON THE FLYER – if you didn’t get one (or want an extra!) please email saveourschoolsdjs@gmail.com and we’ll send you another. FODJ is holding a Summer Fair and Picnic on July 7th. Come and share some food and some laughs, and if you are able, lend a hand! We have lots of jobs (some big, some small) available in the lead-up to the event and on the day – have a look at the form below and let us know what you are able to do. Come and be a part of the fun team who help put the event on, and help to raise some funds for our school and children! Save Our Schools are a rapidly-growing Brighton and Hove-based group of parents, teachers and heads who want to protect our schools from massive funding cuts and ensure every child’s right to a decent education. Across the country, entire schools will come together in mass picnic gatherings to show just how many of us oppose the funding cuts. SOS are holding a School Assembly on May 26th May at 3:30 pm at The Level, Brighton. Bring your children, a picnic, a pen and paper and join other parents, heads, teachers and support staff in a city-wide School Assembly. When and where? Take your pick from two Assemblies in Brighton & Hove: The Level from 3.30pm to 5.30pm and Victoria Park, Portslade from 3.30pm. Take Shelter Volunteers: May 13th, 14th, 20th & 21st. It’s going to be spiffing, do sign up, old Chap. This May at Downs Junior School we will once again be opening our amazing underground Air Raid Shelter and hosting 1940’s events on the middle two weekends in May (13th, 14th, 20th & 21st May) . Last year ‘Take Shelter’ was a huge success because of people like you! Please help us by signing up to run a stall, “Kids loved adventuring into the underground shelter and experiencing a glimpse of what the 40s must have been like”… we all had great fun last time and really got into the spirit of the 40’s, mucking in to make a truly memorable community event. So please sign up yourselves and other family members too if you like (if you put in the notes we can put you together on a stall or nearby) The form takes seconds to fill in and we will be in touch with you nearer to the event. FODJ Spring Disco! FRIDAY 28th APRIL. Sign up Sign up ! FODJ Spring Disco! FRIDAY 28th APRIL. Yeah, the Friday after Easter hols, we like to live dangerously. Loads of fun to be had; dancing, popcorn, snacks, and most importantly all your favourite requested choons with DJ Ghost! Ticket price £3, payable on the door ONLY. Drop off & pick up from the top playground. Healthy snacks will be available for purchase. Raising money for the new exciting Garden Room! Googleform – but your work might not load it. Give it a bit of time. Email Larry Page if issues. The address is http://downsyearbook2017.weebly.com/ for pupils to upload text & pictures by next Wednesday. There’s also a form (attached to download) to sign & return to the office to give permission and make a donation (£10) for the book.